Please your Mom and grandma with some of the adorable and cute handmade gifts and crafts this Mothers day. And by the way, Mothers Day falls on May 10th, 2015 which is a Sunday. Here are some of the crafts that you can try. Hand Print Apron: With this craft, make an apron with your palm prints on it and name each of the prints. This craft could be much better if you have siblings or cousins. Love You Hand Print: Make a Love You hand print craft for your mom this Mothers Day. This craft only requires simple things that are available at your home and little effort. I Love You Because: This is not a craft actually, but something that can be tried at a school or a gathering. If you are planning a small event in your neighborhood this Mothers Day, you can include this item as well. I Love You Grandma: This craft is made with foot print and it an adorable way to wish your grandma happy Mothers Day this year. You Are My Sunshine: This craft is also made with footprint where the foot prints represent sunrays. This craft could be a very good gift for your mom. For The Sweetest Mom: This craft has cupcake cutouts pasted on a cardboard sheet which has the words written, “For The Sweetest Mom”. Hand Print Bouquet: Making a handprint bouquet can be very easy. All you need are few colors. Make this craft and present it to your mom. A Card With Hearts: This craft has hearts of many different patterns on it. And this is for your grandma. Hand Print Art on Apron: Make your mom’s or grandma’s apron a piece of art with handprint. But, be careful not to ruin the apron. Jar Picture Frame: Here’s a craft which can impress your mom or grandma and they will remember this craft for a long time to come. Canvas Hand Print Tree: Here’s a craft with handprint cutout stitched or pasted on to a canvas and flowers placed on them. Following Mom’s Foot Steps: This is yet another foot print craft that is so adorable and will go down the memory lane. With A Cherry On Top: This craft looks like an ice cream cone but it isn’t. Instead, it is a card which has all your mother’s qualities written on it. Forever Bouquet: Make a Forever Bouquet for your mother using hand print cutout along with flower cutouts and gift them to your mother. Give her a bouquet that lives forever. Decorative Flower: Here’s how to make a paper flower with petals that have “I Love You Mom” written all over it. This flower just looks wonderful and we’re sure your mom would love to keep it safe. Be”You”tiful: This is another creative craft that your mom would definitely love and keep it safely. Hand And Foot Print Flower Craft: This craft requires both hand and foot print cutouts along with a pic of yours. You can also write a good message or simply wish your mom a very happy mothers day. MOM Card: This is a card craft with three folds and each fold has the letter M, O and M drawn on them with different colors and patterns. And it looks amazing. 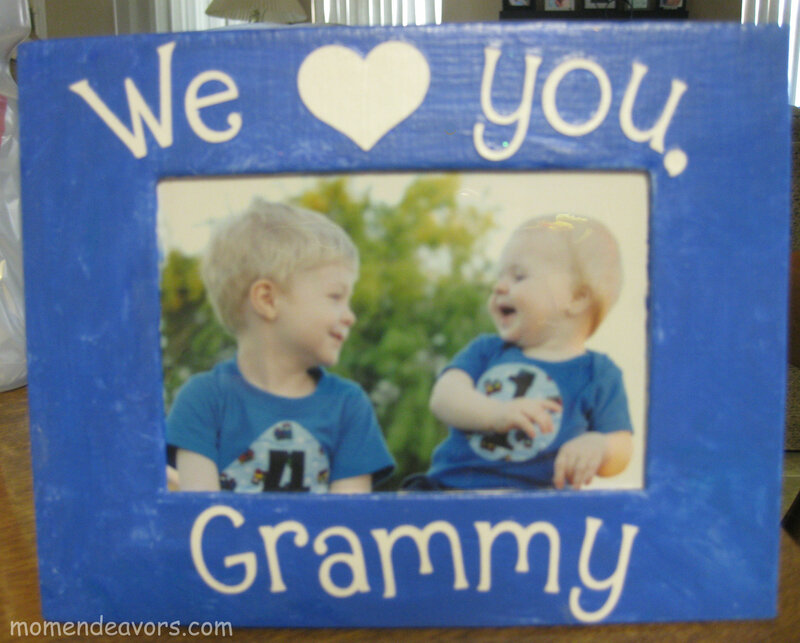 I LOVE U Photo Frames: This craft has pics of kids taken while holding each letters of the phrase I LOVE U. All of those pics are pasted on a frame. Mom Wishing Grandma: Here’s a heart-felt greeting from a mother to her mother. And it is great. Matchbox Locket: Here’s a simple craft that is interesting in making and also looks adorable when your mom or grandma wears it. Colored Paper Roses: This craft guides you in making paper roses and they’ll never wilt. Pipe Cleaner Posies: This craft uses different colored pipe cleaners as posies which are placed in a pot. Mothers Day Candle: This craft can be easily made with large candles and readily available crayons at home. All you need to do is to write MOM I LOVE U on the candles and gift them to your mom. Paper Plate Hand Print Art: Here’s another simple to make craft. Have a handprint heart on a paper plate and write your personal favorite quotes about your mom on it. Foam Sticker Bracelet: Here’s a craft to make a bracelet with foam stickers that says “I Love Mom”. Ribbon Bracelet: Make a ribbon bracelet with pretty buttons stitched on to the ribbon. A Child’s Hand: This is another handprint craft, but its unlike the rest of them. This craft has a message on it, which says, “A Child’s Hand Touches a Mother’s Heart”. Mommy Has My Heart: Here’s a craft which says “Mommy has my heart” written on a paper plate along with handprint heart and drawings of hearts. Hand Heart Cloth Bag: This craft requires a white cloth bag with absolutely nothing on it. Then, you need to put hands printed on it and make a heart shape in the middle. I Need Some Air: This craft requires a balloon and a sketch pen. Inflate the balloon and write your message on it. I Love U Because: This is another Mom I Love You Because craft. This craft is so cute and adorable that no matter how many times its done, it seems, you can do more. Star Shaped Candles: Here’s a craft to make star shaped fragrant candles that can be gifted to your mom on the occasion of Mothers Day. Papercup Daffodils: Here’s a craft of Daffodil flower plant made with cupcake cups, paper leaves and a cardboard box. Thumbprint Flowers: This craft has sunflower like paper flowers with petals and the central parts being colored with thumbprints on them. The flowers are placed in colored pots. This gift is ideal for your mom, if she loves gardening. Foam Flowers Garland: This craft requires pieces of different colored foam which must be cut into shapes of flowers. These flowers are then connected either with a stripe of paper or a thin, long strip of foam. Mama Panda With Baby Panda: Here’s a printable card which defines MOM in its own way. A good way to wish your mom on this Mothers Day. Bookmark Craft Ideas: If your mom is a book lover, then perhaps, you could gift her handmade bookmarks that she can use. The link has some good bookmark ideas. Photo Bookmarks: Instead of the above mentioned bookmark craft ideas, you can always make bookmarks and be creative. You could use your photos themselves as bookmarks. 1 MOM: This craft has popsicle sticks photo frame where you place your mom’s picture and on the back you write No.1 MOM. A Keepsake Box: This craft can be made with simple things available at home. This includes a cardboard box and some colors. Paint the cardboard box carefully with colors and if you have a gift in mind, place the gift inside the box, seal it and present it to your mom. MOM Crown: Make a MOM Crown for your mom and present it to her on this Mothers Day. The craft can be made with a cardboard sheet which has the letters M, O and M cut in a sequential form. Mom Silhouette: Make a silhouette for your mom with a cardboard box and with a black cutout. You could use one of your mom’s photo to draw an outline for the cutout. Photo Magnets: Here’s a craft which your mom will be looking at, not only for just one day or two, but almost a year since you’ve presented it. You Are Loved: Here’s a beautiful craft that can be easily made with just the items available at home. This art requires a stencil, a blank greeting card and lots of colors. Stitched Paper Flowers: This craft takes a little of your time. You’ll require few items such as hole-punch, threads and cards. Kids Are Like Flowers: This craft is a handprint card with handprints as flowers growing on plants. And the handwritten caption says “Kids Are Like Flowers and Grandmas Help Them Grow”. Photo Frame for Grandma: Wouldn’t it be nice to make a photo frame for your grandma, painted with different colors, put in your photos and which said, “We Love You Grandma”. Heart Shaped Garland: This is a heart shaped garland which says “I Love You Mom” and then the garland is made from loops of pipe cleaners. Waving Flowers Gift: This is a simple craft that can be made with pipe cleaners of different colors. All you need to do is to follow the instructions and you’ll be able to make a craft with flowers that wave back and forth to your mom, always. Rolled Paper Flowers: Rolling papers into flowers is one of the best ways of paper flower making and it really looks amazing. Follow the instructions and make a bouquet for your mom on this mothers day. Hanging Plaque: Here’s a simple instruction with which you can make a hanging plaque and write a note about your mom on it. M O M Plates Craft: This craft requires three plates, with strings attached to them and hanging. The plates have M O and M written on them. Mom I Love You: This craft has been made with coloring paper, buttons and decorative gems. 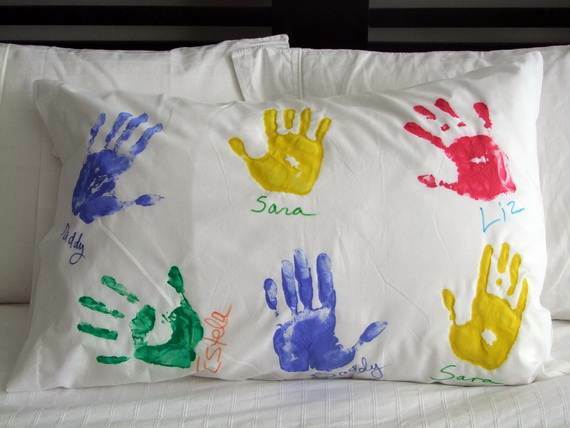 Handprinted Pillow Cover: For this craft, you’ll need to carefully take your mom’s pillow cover and hand print it with different colors. Make sure you don’t ruin the pillow cover in the process. Be very careful while doing it. Hanging Cloth Clips: For making this craft, you’d need three cloth clips, a string and three pieces of paper with M O and M written on them. And place them using the clips on to a cardboard sheet. You’re Tea-rrific: This is a card craft which can be made using a plain greeting card along with cutouts of letters that say, “MOM, YOU”RE TEA-RRIFIC!” and stick a tea cup with a teabag. Tea-bag Present: For this craft, you’ll need a tea-bag which is put on a paper cutout kettle and write a message on it. God Bless My Mom: This craft requires a paper plate along with paper flower art and the writing says, “God Bless My Mom”. Pebble Decoration: Decorate a pebble with different colors and if there is enough space, you can write something like, “Mom, You Rock” or “I Love U Mom”. Butterfly With Beads: Make a butterfly from stringed beads and a cloth clip. Use a pipe cleaner for the string, because it is firm enough to take the shape of butterfly wings. Flower Art: Here’s a flowers craft which has looped paper strips along with different colors of craft cloth. The craft can be tried at home. Best Mom Ever Coffee Cups: If you want to gift your mom some coffee cups or a simple tea set, you could add in a little extra by painting the cups or bowls saying, “Best Mom Ever”. Mothers Day Banner: Make a Mothers Day banner an hang it at a place where it is visible to your mom. Best Mom Medal: On the occasion of Mothers Day present your mom with a medal that says, “World’s Best Mom”. 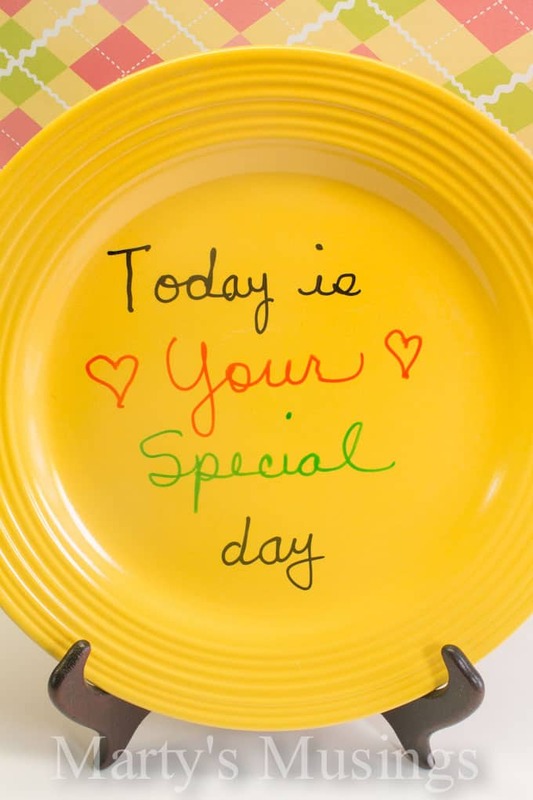 Today Is Your Special Day: Take a paper plate an write the message, “Mom, Today is your special day. So sit back and relax”. Paper Plate Flower Holder: Here’s how to make a paper plate into a flower holder which can be presented to your mom on Mothers Day. Loop Flowers Art: Make a craft which has paper loops as flower petals and a tag wishing your mom, happy mothers day. Place this on a greeting card and present it. Im Sending You Big Hugs: This craft requires you to draw an outline of your hands till elbow length and paste them to a greeting card and write the message, “Mom, Im sending in big hugs”. Paper Cone with Flowers in it: Make a paper cone and fill it with flowers. Make sure that the flowers don’t fall off. I Whaley Love You: This is another cute little greeting card that you can present to your mother. It says, “I Whaley Love You Mom”. You’re Pear-fect: This card has a pear on it and says, “Mom, You’re Pear-fect”. Rocking Sign of Love: Here’s a card craft that’s different from the rest of the bunch. A rocking sign of love for your mom. Home is where: Make a greeting card which gives a very good message to your mom and expresses your love towards her. This card says, “Home is Where Your Mom is”. Draw your mom: For this craft, you’ll have to draw a drawing of your mom and describe her qualities. Supermom: Draw a cartoon and say, “You Are My Supermom” on a piece of blank greeting card. Another Supermom: Here’s another Supermom greeting card. The description is similar to classic Superman’s, but only better. 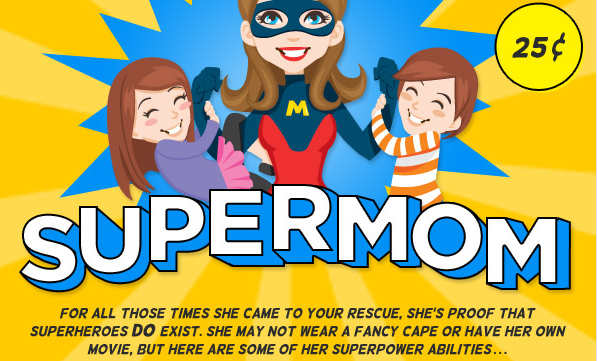 Supermom without cape: This craft would be a wonderful gift to your mom. It says that she’s superhero in the most subtle manner. Smart Moms: This is another card craft which says, Moms! They’re Like Dads, Only Smarter! Tribute To Your Supermom: This card is a tribute to not just your mom, but for every mom out there, because every mom out there is a supermom. You Will Always Be: This is another card that you would definitely want to present to your mother. Mom Deserves a Crown: Make a cardboard crown and present it to your mother. Make sure that it shines like gold and has glitter all over it. Flowers For Your Ever Juggling Mom: This is a card craft where a boy gifts his mom some flowers on Mothers’ Day. 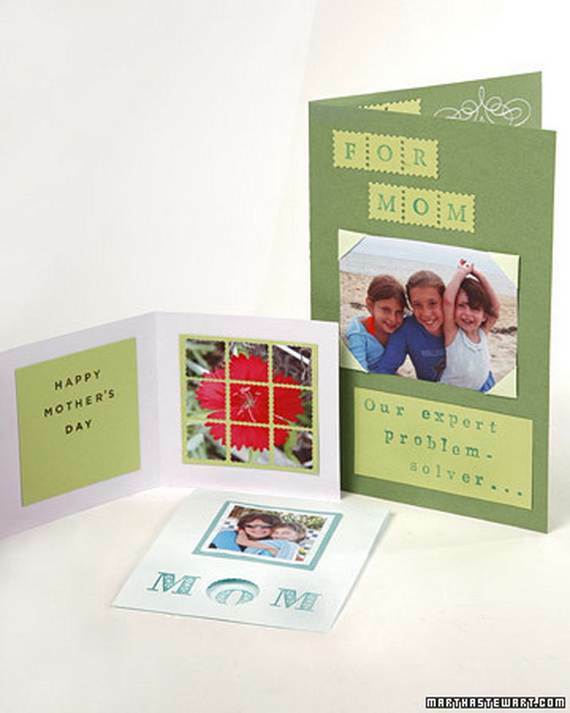 Problem Solver: This is a card craft where it says, “Our Mom, An Excellent Problem Solver”. 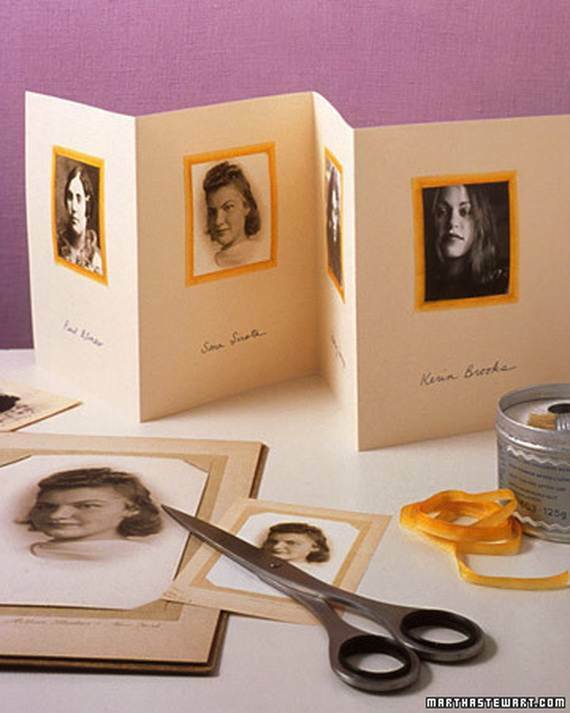 Mom’s Photo Frame: Make a card which has photos of your mom at different ages put on it. This craft will definitely impress her. Make sure to use only copies and not original photographs. Another Crown: Here’s another crown craft for your mom. Its never too many crowns for your mom. Homemade Candle Holder: Here’s an instruction to make a candle holder as a gift for your mom. Flower Vase with Picture: Take one of your old photographs with your mom and paste it on a flower vase and decorate it with flowers. That picture will be nostalgic to your mother. Photo Frame with a message: This is a photo frame craft with a message to your mom written on it. All You Need is Love: This card craft is another great way of saying that your life is incomplete without mom. Lollipop Bouquet: If your mom loves sweets, then perhaps this is the best gift for her this Mothers’ Day. Make a Lollipop Bouquet for your mother by following the instructions in this craft. Cupcake Paper Flower Craft: Make a cupcake paper flower craft by following the instructions given. And don’t forget to mention that you love your mom. Foam Bookmarks: Here’s a craft with foam sheets. Make a bookmark with foam. You could decorate it with foam flowers and foam butterflies. Another Card Craft: Here’s another card craft to present to your mother. Love You This Much: Here’s a pop-cup greeting card which is handmade. Follow the instructions to make this card. Grandma’s Flower Pot: Here’s a craft which helps you in decorating a flower pot for your grandma. Pipe Cleaners Flower Pot: Here’s a craft made from different colored pipe cleaners. Gift this to your mom, if she loves flowers or gardening. Mothers Day Handprint Flowers: This craft is made with handprinted papers which are placed in papercups. Little Plants: Gift your mom little plants in small pots that you’ve planted. Your mom will not only be happy, but will take good care of those plants. Apart from these gift and craft ideas, also make sure that you help your mom everyday during the rest of the year with chores or something or whenever your mom calls you for help. That would be the best gift that you can give to your mom. Have a happy and marvelous Mothers’ Day.